Tortora, Funke, and Case’s Microbiology, An Introduction brings a 21st-century lens to the #1 best-selling text on the market. 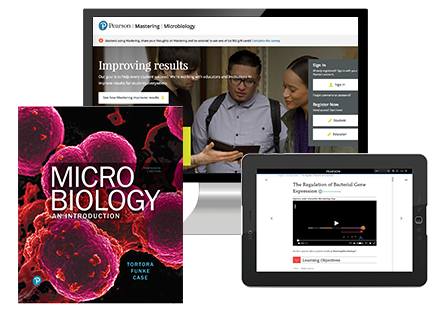 Known for its exceptionally clear presentation of complex topics, this trusted text provides a careful balance of concepts and applications, pedagogically superior art, and robust animations and media via Mastering™ Microbiology. With the 13th Edition, new Exploring the Microbiome boxes present updated research on the microbiome and how microbes influence human health. Four new Big Picture spreads cover vaccine-preventable diseases, the “hygiene hypothesis,” vertical transmission, and bioterrorism. Online videos, tutorials, and animations in Mastering Microbiology coach students through tough concepts. New highlights include In the Clinic Video Tutors that illustrate how microbiology concepts are relevant to clinical scenarios; Interactive Microbiology tutorials that help students understand key microbiology concepts; and Ready-to-Go Teaching Modules that guide instructors through the most effective teaching tools available.